In this thread I will be placing the foundational writings to establish a paradigm of abundance on this planet. The thread is locked so that all the writings can easily be scrolled through. There is a discussion thread here where We can talk about what is presented, and I can answer questions. 01. The End of Entropy An analysis of the tools We just now have available that can end the need to account for Our energy input into the system set up to account for Our energy input. 02. Foundations of Economics An examination of the reasons why We exchange to survive, and what We can do just now. 03. Stigmergic Governance Via the Web Stigmergy is the emergence of overall behavior of a society based on the encountering of information by Individuals. This examines how We could use this natural societal function via the web to govern locally on up to globally, bottom-up rather than all past methods of top-down control. 04. The Ethical Planetarian Platform This is a platform for All who would create better on this planet, in total freedom within the Laws of Ethics. 05. The Plan More, a plan, as Others may contribute better, but for now, it's a plan that We could use effectively. 06. Forget Democracy? Mob Rule? Now We Can Have a Solutocracy! Here is presented the idea that, beyond the three Laws of Ethics, We solve any problems as they arise, rather than "pass" "laws" and then police. With the web, response by Those who care and Those qualified can be rapid and handled. 07. T.A.P., You’re It! This is an outline of resources and solutions on this planet (the foundation of a talk I give), showing how this planet could provide richly for all ALL of Us and ten times Our number of galactic hoards (that like to live like We do). 08. 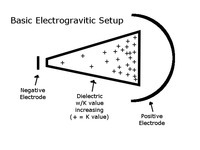 Electrogravitics – A Simplified Description This is what I managed to learn of electrogravitics and presents an alternative theory that explains many of the mysteries in Einsteinian physics. Not to worry, I'm more or less a layman, so it's not too hard to follow. 09. What Would It Be Like Living On THIS Planet? This piece presents a look at how society could function without the need to exchange to survive. 10. F%^&ing People Over This examines motivation to mess with People to the point it's not fun and games, but willful defraudings. 11. Let Us Forgive. A short piece calling for letting go of a focus on Others who in the past did evil and a focus on the creation of better. 12. Liberty and the American Way This examines the fact that moving into The Abundance Paradigm serves all the PRINCIPLES that most Americans would say represent Their country. Freedom, pursuit of happiness, extreme Ethics, honoring the Individual and Each's contribution. So... Scroll down to see articles both popular and academic. If there is value here for You, please share. If there are questions, please join and ask. 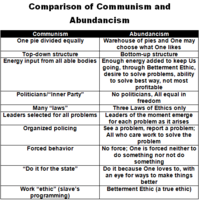 Below is a graphic as an attachment, Comparison of Communism and Abundancism. Click to see enlarged. Click BACK to return. Entropy… That measure of disorder that increases as energy is dissipated into unusable forms effects many aspects of our present human condition. It is easy to grasp the principle as it pertains directly to heat. We see the energy of a fire heat our food, but we also can see a great deal of heat going out unused and unusable. This extra heat can be seen as increasing the disorder, as the molecules affected move more rapidly and more disorderedly. A more difficult aspect to see is the entropy inherent in our social structure. In Jeremy Rifkin’s seminal work Entropy, published in 1980, he does an excellent job of demonstrating that, because energy is at the base of life, itself, entropy can ripple through society, creating disorder even as we try to clamp down and control the order of things. In fact, he paints a very grim picture of what we can expect as we consume more and more energy, explaining that fascist tendencies are most likely to crop up in the efforts to overcome entropy in our society. Today we see more and more signs of encroaching fascism. … Every time we add our labor to a product or perform a service we expend energy and increase the overall entropy of the environment. Every time we exchange money for a product or a service, the legal tender we use represents payment for previous energy that we expend. Money, after all, is nothing more than stored energy credits. If money is merely the accounting of the available energy, it becomes clear that should an energy source come along that has the properties of being effectively infinite, available from anywhere, and negentropic (from “negative entropy”), the need for money dissipates. “Infinite money” has no social application. Energy is the basis of human culture, just as it is the basis of life. Therefore, power in every society ultimately belongs to whoever controls the exosomatic [external] instruments that are used to transform, exchange, and discard energy. Class divisions, exploitations, privilege, and poverty are all determined by how a society’s energy flow line is set up. Those who control the exosomatic instruments control the energy flow line. They determine how the work in society will be divided up and how the economic rewards will be allocated among various groups and constituencies. Given this, it becomes clear that if such an infinite, available, negentropic source of energy were to be introduced, power over others would give way to individual autonomous power over self but no others. This can be seen as a major shift in Consciousness on this planet. This all sounds hypothetical, a waste of time to contemplate even, to the average individual who has been told that we are stuck with the many entropic sources of energy we presently use (which also are sources we have to pay for). “Where is this miracle source?” they might ask. And here is where I bring up the “Dark” Energy that is now heralded all over science shows about physics and cosmology. This energy, which has been called “radiant energy” and “cosmic rays” (Tesla), “orgone” (Wilhelm Reich), “Zero Point Energy,” and many others, is pervading space. It is within you and within me, around all of us, and is present anywhere we go. Interestingly, though we are told of this energy (usually as “Dark” Energy), no mainstream media (MSM) outlet has asked the most logical question: Can we extract this energy in usable form? In fact, back in the 1950’s, the science of electrogravitics was being discussed openly in the aerospace literature, an industry that was studying electrogravitics at all the major players: Lockheed, Convair, Lear, and many others. The discussion vanished, it just wasn’t discussed anymore, despite the fact that so many companies had been drawn into the electrogravitics arena. Reports were that, “They want it secret for now.” Electrogravitics could draw on this energy and create overunity – free energy, in other words. So why was this a threat? Such an energy source would represent, at least, a virtually infinite source that is available to all. Any attribution of a negentropic aspect comes from reports from a number of sources suggesting that cold, not heat, is the defining characteristic of drawing on this source. These reports and the surrounding research and data have surely been suppressed – at least to the extent of not reporting on it and never, ever asking whether we can get something usable from “Dark” Energy. It would be a naïve position at best to expect the present power elite to ignore and NOT suppress and disparage any efforts to develop this source in usable form. The question now becomes, what would happen if we had this energy available to all of us? The answer depends on how we, as a planetary society, approach the matter. Since we’re examining society, it helps to understand that it moves and emerges in fractal expressions from a relatively small seed set of parameters. Up until now, the fractal seeds of all societies in history have included scarcity of energy (which is reflected in the scarcity of goods and money), and thus we see emerging greed, conspiracy, poverty, power elite, wage slavery and many other ills. If we look for a seed that gives an overarching structure for a society’s development in the advent of having such a source of energy available, and take advantage of what media we can to raise awareness to the tipping point of the goals and precepts we define, the society that fractalizes out of that seed will be strong, healthy, and unrestrictive – provided the seed is geared to that end. this sets one parameter of the seed to ethics. If we insist that all farming be organic – in its true sense, and not some trumped up legal definition – our food will grow ever better. If we insist that mining is done with a conscious awareness for retaining beauty and structure, our impact will be small and repairable. If we insist that manufacturing be done such that it is free of pollutants, our planet will remain healthy and abundant. If we are using the Plenum Energy, the energy we use will be clean (and fracture drilling, oil pumping, coal mining, rain forest clearing and other nasty behaviors and consequences associated with petrofuels will be eliminated). If we set this parameter of the seed with the drive to be thoughtful of our planet, our planet will thrive. If we demand open-source in all technology, we remove fears of machines “taking over.” Code can be looked at, published on the web – and better code will be worked out by those whose bliss it is to program things. A distrust of proprietary code (or any other hidden thing) should be promoted. Such a setting in this parameter of the seed will bring forth the best we can create. By creating robots to do all the necessary work no one (or not enough people) wants to, we release ourselves to do what we enjoy – we are released from slavery, having cast it off onto our machines. This seed parameter is one only now available to humanity. Never before in our history have we had the option to create mechanical slaves for every “dirty job.” Therefore, it, along with the addition of a negentropic energy source, will provide a frame for unique emergence, a new societal framework, a new consciousness. … [T]he authoritarian structure of the workplace robs the individual worker of a chance to join in a community with his fellows to make decisions and develop his talents. Unable to join with others to explore his potential and creativity, the individual is forced to retreat into a shell in which he has neither meaningful rights nor responsibilities at his work. All he is left with is a job, a place to make money, and a degrading environment to which he must submit, eight hours of every day. Thus we can see how a seed parameter of encouraging one to follow one’s bliss – since in this new paradigm one can – uplifts each one of us and increases the value of consciousness in society. Having described the seed, how might it be expected to manifest? One of the first products that is likely to be seen are “power boxes,” which will be sold, initially. These would be units that had a mechanism to draw on the Plenum Energy and outlets to plug in our air conditioners, stoves, heaters, refrigerators, freezers, and so forth. This would allow us to move anywhere and bring our comfort items with us. We could “go camping” and still have our amenities, and many will. Eventually these items will each have their own units within. As the cost of energy is removed from the production line at every stage, things will become less and less expensive, and at some point, will be given freely. From this list, it is clear that many issues we now face will be solved. Wealth will be measured in richness of character, rather than in deposits to a bank account. And we will spend our time doing what we like to do, being with the people we like and share interests with. Inventions, rather than being suppressed, will burgeon, and the “Star Trek universe” may be within our grasp, with things like transporters and replicators emerging. And spiritual growth and communication will be encouraged as we find a greater amount of our time available to pursue the exploration of our inner dimension. And though this is not a solution to every issue arising from human interaction – we will always have our personal disagreements – the overall health of society will skyrocket. Yes, we may still argue with others over the smaller issues in our lives, and some may choose to behave violently, but the numbers of occurrences will drop to a level we would consider statistically insignificant. Definitely a vast improvement over what we see today. Then ask yourself why working towards what I present here won’t solve the issue you want to solve, why you wouldn’t be rich in what I show to you, why it wouldn’t fulfill your idea of heaven, why you are afraid, and/or why you look for reasons it won’t work – rather than apply the proactive will to make this happen. If we each choose to create this, since we have all it would take, consciously co-creating towards this goal, what I present would happen. It would take enough of us reaching a tipping point before it would all be downhill, and you may choose your future behavior. Speak for abundance, or reduce the chances that this will ever happen by keeping silent. In closing, I recommend any who work for someone else and also are privy to information (such as methods of extracting usable energy from the plenum) give strong consideration to coming forth with what is known. In the end, you and all of us will be better off – and even today’s power elite, the useless eliters, will retain their life style, if not their power over us. Let Me take You down to the foundations of why We exchange to survive (economics). When We first began acquiring and creating things with Our meaningful energy expended, the product of that expenditure was valued (and represented that energy, with the meaning setting the value) because We did not have the time/energy to acquire and/or create all We might want. We bartered and traded and work exchanged to fill all the gaps. Eventually, these modes of exchange became cumbersome, and We began to agree on tokens to represent Our meaningful energy expended. Shells, beads, sticks notched and split. These also included coins of precious metals, and then bills when hauling metals around in large quantities became cumbersome too. Then the debt system, creating tokens through loans, eventually emerging and enhanced by a shift from paper entries to electronic bits. The foundation of all of it still rests on the effectively scarce amounts of energy to be meaningfully expended. The question becomes, do We really NEED to exchange to survive? What if We added free energy (and I personally know We have such deep in black projects)? What if We added robots in necessary work no One WANTS to do? We Humans will do things We WANT to do for merely the social currency We receive – thanks, appreciation, love, respect, reputation, lauds, name recognition, fame, Self satisfaction – IF We are not concerned about how We will meet the basics in life. So Let’s look at adding free energy. Suppose We spent taxes to build and retrofit everything with free energy. The costs of energy would be removed – all down the line. Products become cheaper and cheaper – initially in any markets with high amounts of competition, but eventually in all aspects as pressure comes to bear. So now, We can spend taxes on filling positions We NEED with Those who love the work, and robots to take up slack. At this point, the need to exchange is extinguished because, since 100% of the cost of EVERYTHING is energy, and We have removed the cost of both external and Human energy, everything becomes free. The amount We spend is irrelevant, for with the removal of money, all financial debt becomes moot. Many of the industries We see today will vanish, being unnecessary: banking, insurance, Wall Street, advertising, accounting, sales, and cashiering (and what percentage of These that hold such jobs LOVE what They do and would not prefer to be doing something else?). Along with these We will see also no more poverty, oppression, wage/debt and outright slavery, and biggest: profiteering. War profiteering (no war: “If You want peace, take the PROFIT out of war.”), prison profiteering, pharma profiteering (and thus the suppressed cures will emerge), medical profiteering, chemical profiteering, food profiteering, water profiteering, air profiteering. It also pulls the money rug out from under the psychopaths that have matriculated to the top of the money/power heap (ALL money systems promote the most ruthless and psychopathic; They are the Ones who are willing to do ANYTHING to get, and keep, money/power over Others). They become equals with all the rest of Us, accountable as Individuals, as are the rest of Us. We WILL create better on this planet. With a central website, in forum style, to address major issues – divided into local sections, regional sections and global sections, with “votes” at a certain level elevating the problems and solutions to the next level to be voted on by a greater number – we can collectively coordinate to solve the issues of this planet. Social responsibility will be seen as spending 15 minutes a day (or more) reviewing the issues on this site. This seed parameter will see an emergence of human unity as a race and as a planet. A very good illustration of stigmergy is Linux. In this case, one Individual created a basic program and offered it freely in open source. Others came along and began to improve upon it, create software to run on it, and so on. There was no "leader" in this group - those who wanted to get involved did so - and from the initial basic program, a whole creative "empire" came to be...all entirely free and freely. And so, from this aspect of Our nature to do work on things We care about, whether We are paid or not, I developed a system of governance. The basic idea is a central website divided into local, regional, continental and global sections. Much like a forum, People could post problems They see to Their local section (or any other local section where the problem may exhibit itself). Others, reviewing the site, may "vote" to say They think the subject is a problem too, with "stars" or "thumbs up" or whatever. Votes down are also allowed. Apathy can be demonstrated by not voting at all. Solutions can be posted and be "cheered" or "booed." In the event a solution is seen to be a good one, leaders of the moment will act to implement the solution. It can be the original poster or any Other concerned individual - the leaders will emerge to solve the problem. When enough votes up occur without a solution that is seen as particularly good, the issue is elevated to the next level, the regional level, where more minds can work on the problem, offering help and/or solutions. More People can vote the problem up or down. And so on up to the global level. If a problem is so severe and/or important that it reaches the global level and STILL no solution is found, I guess the Human race is SOL. But few problems will reach that level, and virtually never will they go unsolved. The difference between a forum and the site will be that problems will be listed not in terms of date added but in terms of the net number of votes up (votes up minus votes down). Also, there will be a section of issues unread. The original poster will have the ability to remove a problem once it is solved or is no longer a problem, at which point it will be archived. Problems with no activity for three months (or six, or some number as deemed reasonable) will drop off and be archived. There will be a special section for emergencies - and Those whose bliss it is to help in any given emergency will be able to monitor this section and take action. Those who care will be enabled to help. Sue has a problem - any problem at all. She goes to the website and posts it. Her neighbors (and anyOne else) can vote relative to Her problem. They can offer solutions. Discussion of the problem and its solutions can take place in the problem thread, just as in a forum, and from that, Her problem will likely be solved or will not be seen as a problem by Others. If no One else sees a problem, no votes up will be received - and Sue will have to make do with what She sees as a problem, finding Her own solution. This will be rare. If no One else sees a problem...chances are it really isn't a problem to begin with. As an example, Let's say Sue has a problem with noisy neighbors. She posts the problem. Others ask if She has talked to the neighbors. Yes, Sure replies, She has. SomeOne suggests that She move. Another suggests ordering and installing soundproofing. Sue considers Her options and decides the move is better than the soundproofing. She thanks the People for the suggestion and indicates the problem has been solved. Instead, Let's say the problem is more difficult. A dam above Her house is showing signs of giving way and She reports this. Many others see that They are threatened too. They vote the problem up. Some also start making suggestions: get robots out there to shore the dam up. Drain the water behind the dam. So on and so forth. Discussion ensues, and meanwhile more People, though not immediately affected, see that it IS a problem and vote it up. Soon, it reaches the regional level, and someOne who has experience dealing with such problems chimes in with His solution. Many cheer it and that One begins the process of solving the problem. Those who care join to help. He directs them and the problem is solved. In this way, We Humans can be directly involved in running Our planet, allowing the BEST solutions to be implemented (and not the most profitable or cheapest). As I mentioned, this is not a system for use where moneyed interests are involved. In fact... No governing system works well as long as money is involved. This is one more reason to eliminate money as a necessity. If there are issues You see, please let Me know. Or any other comments. Have You tired of the empty promises of politicians? Have You seen the “divide and conquer” successes in everything from school teams to country identities? Do You want the planet to coexist? Perhaps You might consider the Ethical Planetarian Party. What is the Ethical Planetarian Party? What are its goals and platform? In other words, We choose to maintain civil interaction, face to face. The biological parent has precedence in the case of Our children, unless there is evidence that these same Laws are not kept with Them as well. They are Beings, too. Beings are any who ask for rights, or have Others of the same species ask in proxy if They are unable to ask, Themselves. This is not license to mal-treat beings of “lower” Consciousness, for all Consciousness should be respected. The goal is for as much of Consciousness to spend as much of the time as possible comfortable. A quick, clean and honorable death for the flesh a Being eats, having been given comfort throughout the life of any domestic food. Second, We are predicated on the idea that Humans should be free to take advantage of the abundance of the planet by eliminating money through free energy. Third, We strive to allow religious choice, believing that there are as many Callings as there are Beings, and as long as the Laws are kept, how One approaches that which One is, is to be respected. Fourth, We expect the use of technology under these Laws, with peaceful intent, including free energy – the key to eliminating money. We know much is presently hidden in fear that We might exact retribution or follow folly, but We are of the opinion, based on evidence, that when Humans have no money, generosity and loving behavior are expended to help Those in need. With technology We both have personal awareness of and much science and anecdote grasped, We know We can eliminate money as a necessity and provide abundance for everyOne. We call for the release of electrogravitics from black ops, where it has been held secret for over 50 years. We are out to eliminate poverty. Fifth, We will bring forth a website where problems can be brought up locally and People can “vote” to bump a problem up, down, show apathy by not voting, and chime in with solutions (which can be cheered and booed). Issues will drop off after the original poster indicates that the problem has been resolved or withdrawn, or there has been no activity after, say, six months (that is not set in stone). Social responsibility will be defined as spending 15 minutes a day examining issues on this site. Also, issues with some set number of bumps up will be considered issues that need a wider awareness and go to regional sections. From there, continental, perhaps, and then global, as more are needed to be involved in solving the problem. Problems will beget the awareness to solve them. Without money as a motive, problems will be solved more creatively, directly, harmoniously, and within the three Laws. Sixth, We are staunch in our support of an organic planet. Though hybridization is an awesome tool, genetically modifying organisms is NOT. Without money, there is no motivation to create GMO. We know that organics can produce on par or better yield and better nutrition than their petrochemically “fertilized” brethren. Any non-organic approaches to problems will be highly discouraged, unless it is seen that such a solution is the best. Beyond this, sustainability is Our goal. Seventh, We see that, without money, We can build machines – robots – to do all necessary work. Without work as an “ethic,” We substitute a Betterment Ethic, and encourage all to look for ways – within the three Laws and with organic solutions prized – to improve conditions on this planet for everyOne, and offer these ideas for consideration and possible action. Eighth, We understand that virtually all crime is, on one level or another, related to money, and without money as motive, virtually all crime will vanish – leaving the very few, passion-related crimes for Us to deal with. We will deal with all crime publicly, and Those who care can and will decide each case. Most such choice of behavior will lead to social pariah-hood for the perpetrators. Ninth, We support open source in all things We program. This allows for many to make suggestions for betterment, and ensures that no one will create outside the three Laws. It also eliminates “back doors,” and other surreptitious software segments that bog down the clean functioning of the program. Without money as a motive, programmers will be proud to offer Their work for scrutinization and use, openly and freely. Status will be gained for creating the best programs. Tenth, We understand that food waste is rampant with food distributed by profit, abundant as it is but poorly and/or untimely delivered. Without money, food distribution will be based on need and not profit, ensuring that waste is minimal, food is fresh for all (no One waiting for the wilted cast-offs), and readily available. Though these approaches are revolutionary, We understand that if enough People are on board, a fresh, free, fun, and fulfilling life will be Ours – and everyone else’s – as We choose. No One needs to change anything except where there is a problem – and then Those who care are free to solve it within the three Laws. Without money, bureaucracy will become unnecessary, vastly reducing paper use, and streamlining solutions. Jobs in banking, insurance, and other such money-related industries will disappear, and in their place, the opportunity to spend time as One wishes. Transportation will be free – for Ourselves, Our food and product systems, and any other transportation needs. This offers the ability to go where One wishes, moving food to where it is needed, and other freedom We presently do not have, with transportation energy costing so much. We are a planetary party and decry any solutions that maintain a “divide and conquer” attitude or outcome, including stateism, nationalism, partyism, teamism, etc. We are one species on one planet, and we seek to benefit the planet ethically and wholly. To join, merely state that You are a member. All that is required, as a Party member, is to inform Others about the Ethical Planetarian Party – send this link, or copy and paste to email this content. Last Edit: Nov 30, 2014 22:20:32 GMT by Amaterasu Solar: Punctuation. How do We implement the abundance paradigm (TAP)? 2. Allow either toadies who see that They will live as richly - or more so - to release free energy tech, or private inventors to have breakthroughs as more and more work on it. 3. Spend taxes to replace or retrofit with free energy, using BEST design, not planned obsolescence, in business, industry, agriculture, transportation and homes. 4. Spend taxes to replace workers who don't WANT to do the job They have with either Those who would LOVE it or robots. 5. Put together a central site for reporting and solving problems as described above under Stigmergic Governance Via the Web. 8. Teach Our children to find Their gifts and develop Them. So We operate under these decisions for Us as best We can. We vote for "laws" that Others must follow, and justice is served poorly with the letter of the law at times being clearly opposed to the spirit. (Or at least the spirit We were sold it as having.) Or We vote for a representative who is supposed to vote in Our interest, but money nearly always buys that One out. This is how democracies and republics operate. Without a profit motive, these Laws are pretty easily kept. Why would One defraud another of something when that something can be ordered on the web and delivered all for free? Why take things that belong to Others? And murder is a money thing. So rare is murder outside of wars - drug wars, corporate wars, "elite" wars, domestic "wars" (all about money/power) and ordinary war profiteering wars. No, can't solve for jealous lovers who lose it. Can't solve for a few others - but the bulk of issues are solved for, the biggies: poverty, oppression, wage/debt and outright slavery, and profiteering. In a society that has solved for profit motive (i.e., gotten rid of the need to exchange to survive), is democracy really what We truly want? Many have said that democracy is "mob rule," and because it imposes (or is presumed to) the will of Others over the will of One, it can easily turn out that way. Here is where I offer up the idea of a solutocracy. Rather than voting on whether or not We want to (try to) make People behave a certain way, perhaps We should address whether some behavior is a PROBLEM in any given case. Beyond the three Laws - which, when broken are always a problem to one degree or another - a problem can be quite subjective. The more who look, the closer to objective perspective overall will be perceived. If a community looks at a reported issue and also see a problem, then a problem likely exists. On the other hand, if no real problem is seen, then it's probably best left for the Ones involved to handle. With the web now covering a large portion of the planet, a central site could be set up, open-source programmed, where local, regional, continental, and global levels can be accessed, where reports can be made at the local level of problems, big and small. Solutions can be discussed, and if enough People think it's a problem and vote for it, it goes to the next level. Each time it moves to a higher level, more People are available to offer solutions. In this way, local problems can be solved locally, but if the problem is big enough and there are no soltions locally, additional resources from a wider scope can be drawn on. No One is limited to voting on just Their own local issues. This allows for People who believe They have been wronged to put a call out to friends to vote and comment, as well. In turn, if both sides have many They call to vote, the problem can be moved up a level and more objective a perspective will emerge. Solutions will be more "fair." Also, involvement will tend to be amongst Those who care about solving a given problem; no longer will People be interested only because there is a money angle. Either the problem elicits concern or it does not. It is small indeed if very few see a problem at all. From such a structure, the People most skilled at solving a problem will emerge - as each Person offers a soltution, Others will evaluate the solution and will implement it if enough see it as a good solution. 1. Most looking at the problem will NOT be vested in it. 2. If a group is pushing for an "unfair" solution, a larger group will emerge to push for a better solution. 4. In a system that does not set rules, but rather examines each problem as it arises, mob rule (as the term "rule" implies) cannot "rule." So rather than voting for People to vote for "laws" that apply whether there is a problem or not (and frequently creating more problems), We only look at things if there IS a problem to begin with. Rather than expecting one Individual to have expertise in solving all problems, the BEST Individual(s) for solving any specific problem will emerge. In such a system, One is then free to do anything and everything One wants to do within the three Laws, and as long as Others see no problem. And when a problem arises, a high degree of objectivity can be achieved in solving it. I suggest that We consider this form of governance over governMENT (controlMIND). From this system ALL are able to pursue life, liberty, and happiness with ease. Let the Humans who CARE solve the problems. If no One CARES, where's the problem? With the Web, caring spreads widely. What of the People who love power? This is a question I have been asked, relative to T.A.P. I ask, what of Them? I do not discount the influence of charisma, but most of the Ones that rise to power in the scarcity paradigm have money behind Them. Let Us consider a power-hungry and evil Person in a Society that judges Those They meet based on the three Laws. If this Person has no other bliss, and can offer Others nothing but this Person’s ideas to motivate Them to help with the plans – You can’t have power over Others without having “minions,” otherwise You become a “lone gunman” and We take You out of social circulation – that Person had better have some amazing charisma. And until You have a decent sized base, You are, at most, a gang, and too many waves made will cause Us to take the gang out of social circulation. Today, We judge Others by “laws” artificially and frequently non-ethically decreed. Profit motive and political connections lead to “laws” that are created for special interests. And because “laws,” once enacted, just stay unless We see radical issues and move to remove the “laws” – like Prohibition of alcohol – they stay on “the books,” We have millions of “laws” and cannot truly judge others except by the “laws” as We think We know them, or rather, by “laws” as We think they should be. Many of the “laws” contradict each other, and there is no way any of Us can know them all. What We see, therefore, is intrusion, curtailing of liberty, inconsistency, and limited ethical judgment. You can think and believe whatever You want, but it is by Your choice of behavior You create, and so how You choose to behave will be the measure by which You are judged. If Some don’t like Your choice of behavior, don’t spend time with Them. If You are not fond of anOther’s behavior, don’t spend time with Them – and if the behavior breaks any of the three Laws, You (and any Others who care) may remove the One choosing poor behavior from social circulation. Of course, as Accuser, You will be held to the same three Laws relative to the accusation, and Many who care may not take Your side. So always choose Your behavior wisely. The model, which I say is a far better one than relativity, is subquantum kinetics (SQK). Its developer, Dr. Paul A. LaViolette (an interesting character, to say the least), started with chemical kinetics (as above, so below?) and came up with SQK, being very concerned by its gravitational predictions. He had not heard of the Biefeld-Brown Effect, nor the work of T. Townsend Brown. He struggled with these predictions until He encountered Brown's work, discovering that SQK predicted exactly what Brown was showing experimentally. Why is SQK better than relativity? It takes no element on faith: Einstein's relativity is based on the faith that matter somehow "bends" space-time. Nowhere does He explain (or even try to) HOW or WHY this might be. One just has to take it on faith. It explains things without the need for "renormalization;" relativity ends in infinities without this mathematical fudge. It integrates EM with gravity. Einstein Himself died still trying to do so. And it still predicts things like the lensing of light, the apparent time dilation, and all other predictions of relativity, plus more - all of which are testable (string theory is 100% untestable). In fact, many of the mysteries of Einsteinian mathematics are predicted in SQK. I recommend reading a book called Secrets of Antigravity Propulsion, by Dr. LaViolette, for more on the Biefeld-Brown Effect, Brown's work, electrogravitics, SQK, and more. In SQK, positively charged particles have a positive gravity potential "well." (Positive particles have positive gravity.) Negatively charged particles have a negative gravity potential "hill." (Negative particles have negative gravity.) The positive particle's "well" is just the smallest fraction bigger than the negative "hill," accounting for the apparent weakness of gravity, where essentially even amounts of positively charged and negatively charged particles make up common matter, and in quantities as big as the earth, say, offer a slight "well" overall, thus explaining why We are aware of gravity at all. The Biefeld-Brown Effect was discovered when it was noted that a dielectric with electrodes attached at either end, would apparently lose weight when charged if the positive pole was pointed upwards on a scale, and apparently gain weight when reversed, when placed on a scale. It was soon discovered that it was not a weight loss, but a movement in the direction of the positive pole. Higher voltage increased this effect. Further study showed that the higher the K of the dielectric, the more pronounced the movements became. Asymmetrical electrodes contribute to the increase of the effect, as well. Also, a non-linear dielectric produced greater movement than a linear one. With high K, non-linear dielectrics, a substantial force could be observed, even to the point of levitation with a local gravity field induced. 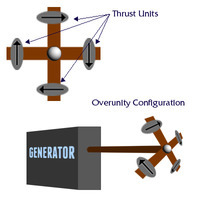 If, say, four devices were placed on a cross, each oriented 90° to the center and pointing in the same direction relative to that center, and a shaft was set at center and into a generator, when small amounts of energy are used at high voltage on the units, the resulting rotation will induce a greater output at the generator than the input to the units. Overunity (as energy is drawn from the zero point field) is achieved. What Would It Be Like Living On THIS Planet? Let Us suppose You live on a planet where You (and everyOne else) had set things up such that action took place via communication of needs (and desires) - because the planet had so much to give that accounting for it seemed pointless. Rather than making each Individual contribute, "earning" a living (as if being born demands an obligation of any kind), as if the planet could not give vastly more than the whole population could spend the time consuming (should anyOne choose to try and do so), problems are addressed directly, from needs to emergencies. To the People, the Conscious Beings on the planet, it isn't so much a matter of sharing but that of communicating needs which are readily fulfilled by Others who care. The People who care to see that all are fed communicate what is needed and Those who can help the process do so. The communications webwork is available from anywhere. Earning status in Their field, it is maintained by Those who love to program, applying Their skills to improve the open-source code that is used to operate the distribution of requested materials. All is run on energy drawn from the aether (with tech presently hidden on Earth). You see that Some get most of many single specialty items, being the Ones REALLY into that item, though with a "first come, first served" policy for web orders, and a "the Creator can give what (S)He wants away to Those (S)He personally wants to give them to" attitude,"specialty items" as a category is overflowing. Neither You nor anyOne around You has to worry about how food will arrive on the table, for on Your planet the People are motivated to solve for need (not profit). You see that all People can post on the open, stigmergically regulated (did I lose You with that? See links below) rather than top-down, webwork of communication. With only these three Ethical Laws, Those who care can judge whether crime has been committed. You may be surprised to see no concept of "retribution." Instead, You see confinement and treatment of Those who pose danger to Others, and shunning of Those who break Laws who don't. Any heinous crime will draw a plethora of caring. All evidence may be presented at trials (which are convened publicly when 12 or more People care enough to call for one). You see communities with agreed-upon perspectives in morals, religions, flocking together, with no persecution. With no One seeing threat from another group, and with the People of the planet as a whole seeing danger only in Those who would choose to break the Laws, what is there to gain by creating a problem? In fact, the third Law is virtually moot. There is no motive to defraud, really, and little to work with. Perhaps One covets a specialty belonging of anOther and contrives to lie to get the Other to give it to One...like a painting, say. But as a problem in society, it does not register. Rare is there an issue with the breaking of the second Law. Why take what You may have for free, as far as needs (no One steals food), and why become a social pariah by choosing to take or damage the specialty items of anOther for mere desire? One thing You see is a system of "personal witness," Individuals may record Their perspective. There is no organized surveillance, but that All may record in public (it is an inalienable Right) and also in private, where failing to have permission from those One is with is seen as distasteful - to even a breaking of the third Law. Courtesy runs deeply, for the power is not through control of a money supply, but in how much support for YOUR work You have. You notice that Some carry arms openly, and Many more do not, but that One who does not look armed could be. What You don't see is stress. Not in a survival sense. You see encouragement in each child to find what They are good at, what They love, what fascinates Them. Children are all wanted, loved and cared for, watched and taught. With a Betterment Ethic (where We here on Earth have an idea of "virtue" placed on "work" enriching the few, and placed by Those few who would profit from Us working to Our death for Them (wage/debt slaves)) You see People striving to make things good, and better where They see the possibility - to deliberately worsen things is to create a problem that will be solved for by Those who care. One rarely chooses to make it worse. All around You, People are learning about what interests Them. There are open guilds where crafts and skills are taught by Those who know and love to teach, earning status as teachers. In fact, teaching is viewed as one of the high status choices One can make. Many are collaborating on projects to solve problems the BEST way - not the cheapest, or most profitable for someOne on the "inside." Or worse, as often happens here on Earth, leaving a problem unattended because there is no money. No artist lacks tools, no musician lacks an instrument, no acting troupe lacks a stage, no scientist lacks a lab and collaborators, no mountain climber lacks the gear, no camper lacks a tent, no traveler lacks transportation, no One lacks amenities of highest quality. There is no motive for planned obsolescence. All goods and services are offered at the highest quality, and the rampant waste produced by the profit-motivated making of inferior products that We see here on this planet does not exists. There is no controlMIND (governMENT) with a central body that dictates to the masses what They can and cannot do. No statutes, acts, bills, rules, regulations, mandates, ordinances, constitutions, declarations, or other "laws" except as any community agrees to, and if One chooses not to abide by any such "laws," One is free to move elsewhere, and can easily do so. The technology is very high, as there are no efforts to suppress technologies that threaten profit or power over Others. There is no such thing as profit (in any money-making sense) or power over Others. The only profit is in the social currencies: prestige, status, lauds, thanks, bragging rights, love, gratitude, fame, and other social earnings. And now that You see the happy and glorious life You would lead there, consider: Our planet is just as abundant as this planet I describe. If ALL of Us were to try to consume everything We could create with advanced farming methods such as vertical farming, if ALL of Us had a place that We were comfortable living in, if ALL Our products were made to last, there would be vastly more than We could eat, vastly more space than We could take up, vastly more in products than We could use. This begs the question of why, when Earth has what Our imagined planet has, We see what We see today: poverty and privilege, oppression, wage/debt slavery, and profiteering (war profiteering, prison profiteering, pharma profiteering, medical profiteering, chemical profiteering, food, water, air profiteering)? It also leads to another question: can We create the Earth in the image of this dream planet? The answers are simple - though You may think they're not. The articles above outline a path to creation of such a planet out of the mess the useless eliters are making of Earth now. Do share widely. Only if We have widespread dialog on these ideas will We take the actions necessary to turn Our planet from this useless eliter wasteland into a place where Humanity truly can thrive. I debate the use of the %^& in the title, but I figure the words may go further if I play coy. I’m generally quite straightforward. I then asked what the percentages might be. What percentage of that behavior was for money and what for fun. He and I both know that money is the primary stakeholder there and He said as much. Fun was far less the motivator, with some fair degree of overlap. Now, Thor knows that I see a way around the money motive for f%^&ing People over, around the need for money, and have rather devoted My life to it. The solution is simple, except that awareness of it has to spread to enough of Us. And so I suggest You contemplate sharing My words. Money facilitates the production and flow of needed goods physically (and a whole lot of unnecessary and fictional goods and services), motivating People to add energy by paying Them to do what is repetitious, hard labor, boring, and other jobs few want to do. Can We solve that with, say, robotics, perhaps? With an “If enough People WANT to do it, no robots needed” approach, We neither force People to do things nor force Them NOT to. Money motivates Us to do things We don’t want to do (see number 1). That money motivates Us to unethical behavior choices as well, on such a grand scale, cannot be discounted. Without money, I suggest a replacement of the work “ethic” (which installed the promotion of the non-creative behavior of doing work We didn’t want to do, to the enrichment of few) to the Betterment Ethic, which is a true ethic. A far better use of Human energy, don’t You think? The Betterment Ethic also promotes Us choosing to do what We love to do – as long as it’s not f%^&ing People over. Instead of promoting f%^&ing People over for money and the power to f%^& over Others on a large scale that it affords, We are encouraged to use Our gifts to better the way things are. The f%^&ing with is fine as long as it is in good fun. Choose too obnoxious a set of behaviors and You become pariah. Break the three Laws of Ethics – don’t choose to hurt or kill anOther against Their free will and informed consent, don’t choose to take or damage the property of anOther, do not choose to defraud anOther – and Others will be interested in making You pariah on up to permanent confinement. So there We solve for the need for money AND what direction all the Human energy is mainly focused in. New paradigm: Do what You love to do, aim for the betterment, and don’t f%^& Others over. Earn respect, not money, for the ways You create betterment, be it happiness in Those You encounter, helping Others get what They need, or a cure for a deadly disease. The psychopaths, the useless eliters, that hold virtually all the wealth on this planet, breeding and ensuring family psychopaths to pass the wealth on to – with an end game of total control over Humanity – will become equally as powerful as anyOne else, with social power being derived from the choices One makes in contribution to betterment. Live and let live as long as someOne is not f%^&ing Others over. Adding free energy, adding robotics, adding an awareness of these facts about money, adding the Betterment Ethic, and adding a will to spread awareness on the part of You, I’m betting We can choose to create a much better place for, statistically speaking, ALL of Us. With the Interweb We have the ability to spread awareness much faster around the planet. On Your mark. Get set. Go! Let us forgive the Power Elite who choose to create the Down Trodden by hiding technology and news. Let us forgive the Toadies, who know they behave unethically, but the money and status lure them astray. Let us forgive the Slaves, who have but a piece of the total picture and dutifully fulfill their Work ethic tasks in return for some time they think is free. Let us forgive the Stars, the ones who show us what others want us to see. Let us forgive the Influences who see Beings of human construction as cattle or sheep. Let us forgive the Influences who have held so little faith in Beings of human construction. Let us forgive the Defrauders, whether Down Trodden, Power Elite, Toadie, Slave, Star or Influence. Let us forgive the Incurious, who reject much data and do not investigate. Let us forgive those amongst us who do not believe as we do in matters of the Spirit. Let us forgive Beings born of a different nature than ourselves, be the difference in preferences, physical configuration, capacity, ideology, coloration, or status – within the three Laws of Ethics. Let us, instead, stand both tall and humble – tall in the knowledge that we are true Beings who are capable of Love, and humble in the awareness that we are equal to all others. Let us show we are worthy of forgiveness and want our place as equals by forgiving our equals. Liberty and freedom are often used to mean the same thing. The ability to choose for One’s Self how One spends One’s time/energy. Both presume the three Laws are binding principles, and Individuals presume other “laws” as well (really all beyond the three are statutes, acts, bills, codes, rules, regulations, edicts, mandates, ordinances, and so on). The difference is that “liberty” is what a ship’s captain gives to His/Her crew, while “freedom” means there is no Other that One must satisfy against One’s choice. One does not have time run out and have to return to duty. So We may ask who gave the U.S. “liberty?” Who sold Us “liberty” as “freedom?” When does this “liberty” run out? Who do We report to? Do We even have freedom? Do We give lip service to freedom, but want to have someOne We can give up Our freedom to for the “safety” of the “ship?” What would freedom ringing look like (to mix it up a bit)? Looking around, I think it is safe to say that freedom is rare and only afforded fully by money. Virtually all of Us must find some way to input Our energy so as to have liberty to enjoy any freedom We can afford. We must go to work, We must choose from a wide array of less than enticing ways to plug Our energy in so as to afford, not freedom, but merely what We need to survive. Does this sound like freedom for all at all? Sadly, We are a country – and even a planet – of “consensual” ship conscripts – Our consent given on pain of death, from starvation, exposure. Our “liberty” is rare. Our freedom, nil. If freedom was ringing, We all would have the choice of how We spend Our time. All of it. Not just what time We have around Our job, not just in ways We can manage to afford. Within the three Laws. I cannot see any reasonable Human thinking it’s a good idea to break the three Laws, and in most cases where the Laws are broken money is motive; the power over Others money affords is involved. What percentage of hurting/killing anOther is done for money? War surely is 100% for profit. It is incited through pretense: false flags, psyops, yellow journalism, rumor; and then weaponry, ordinance, and so forth is sold to both sides by the same interests. The war industry is always the only winner. The thug hurting or killing to rob is choosing that behavior purely for monetary gain. The murders of those who threaten profits… I’m going to say that except for jealous lovers and the psychopathic lust for pain/blood from anOther, virtually all such behavior choices have money as a motivation. The first Law: Do not willfully hurt or kill anOther… If none of Us had to worry about, and in fact had Our choice of, what food We might eat, what place We lived in, what project, with Betterment Ethic in mind, We might choose to do, how much deliberate hurting or killing of One anOther do You think We would see? More or less than We see now? The second Law: Do not willfully take or damage the property of anOther… If the abundance of the planet was flowing to all of Us freely, and We had all the basics available for all, and did things for Others – performed a concert, painted a picture, built a rocking chair, took Others along fishing, got with a group that was working on archaeology, laughed with and shared with the People We love, how much stealing, destruction, would We see? More or less than We see now? The third Law: Do not willfully defraud anOther… Except in Human social interaction, where lovers lie – which cannot be solved for – again, virtually all defrauding is for a monetary gain, a power gain. Without a psychopath’s pyramid to climb – the money game, the power game – how much defrauding do You think We would see? More or less than We see now? Getting back to liberty and freedom, don’t You think freedom would prevail for all of Us if We removed the need for money? Wouldn’t it then follow that the call to let freedom ring is best served by spreading awareness that We just now, in the history of Our planet (as taught in the schools), have the means to eliminate the need for money? Wouldn’t that truly be…the American Way? We can eliminate “liberty” in favor of freedom, the freedom to show Our worth or choose worthlessness. The freedom to find Our gifts and develop them rather than be forced into “reality” and a job that consists of asking Others if They want fries or not. The freedom to learn as fascinates Us, rather than rote and rot. The freedom to spend Our time as We choose. If You are a true American...help make Others aware of how We can realize the American Dream of freedom. Share the articles above.